It’s mid-February and a rare few days of sunny weather has hit the Washington State’s notoriously wet and stormy Pacific coast. So I packed my backpack and drove west from our home near Seattle to land’s end – Cape Alava – the westernmost point in the coterminous United States and a remote point in the wilderness of Olympic National Park. (see coastal hiking information at the end of the article). 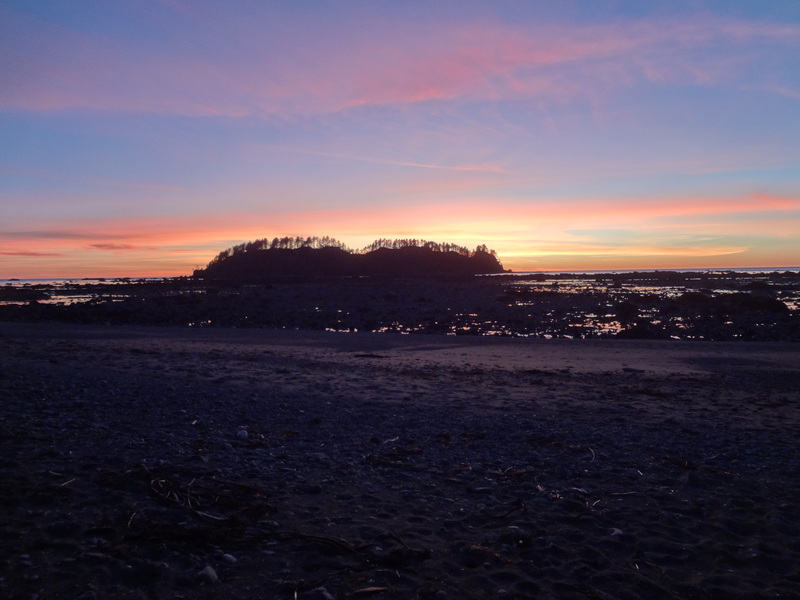 It seems appropriate for Cape Alava to be in the middle of the only coastal wilderness area in the coterminous United States rather than a roadside stop along the highway. A place this special deserves to be protected. There are no motels, souvenir shops, restaurants, no roads – you have to hike in to get to it. But once there it’s a spectacular wild coast of eagles, sea lions, and deserted beaches lined with driftwood logs interrupted here and there by forested cliff sides plunging into the surf. Even driving to the Ozette Ranger Station at Lake Ozette where the hike begins is a journey – it’s not near much of anything. But once there the hike is easy, just three miles over cedar planked trails to Cape Alava with no elevation gain worthy of mention. For this trip I decided to make a loop hike by starting at Lake Ozette and hiking the three miles to Cape Alava for the first night. The next day I hiked south another three miles along the Pacific coastline to Sand Point. The following morning I hiked back out to Lake Ozette from Sand Point, another short three-mile hike with the whole trip forming a triangular loop only nine and a half miles in total. Many people do this entire loop as a day hike (albeit a long one), but I wanted time to explore each area. So I drove to the northern Olympic Peninsula city of Port Angeles. Even the ferry ride across Puget Sound from Edmonds to Kingston on the Kitsap Peninsula was gorgeous with the volcanoes of Mt Rainier rising over Seattle to the south, Mt Baker shining in the morning sun to the north and the rugged Olympic Mountains rising behind Kingston to the west. After Kingston it’s a two-hour ride to Port Angeles where I picked up my wilderness permit from the National Park Service station and then drove another two and half hours to Lake Ozette arriving about noon. As predicted the weather was sunny, even warm. I had picked a Monday to hike in and would hike out on Wednesday, so I hoped there wouldn’t be many people. In summertime this hike can be crowded, but now in mid-February I hoped for few or even no people – I wasn’t disappointed. The hike to Cape Alava was uneventful, a quick one and half hour tromp through cedar bog lands and gloomy spruce forest which made me grateful for the cedar plank walkway the Park Service has built over the soggy, marshy ground. And suddenly, there I was overlooking miles of empty coastline, sea stacks (pillars of rock and small islands) sticking up out of the surf and the Pacific Ocean stretching off to the horizon with the sun reflecting off its calmly rolling surface with a blinding, brilliant light. I dropped onto the beach from the low hillside and crossed a small stream full of coffee-colored water (fresh water draining to the coast in this area is often dark-colored due to tannic acid dissolved in it from decomposing vegetation – it’s potable, but locals call it Ozette Tea). This would be my water supply for the night. I crossed through a grassy meadow while a few deer grazing in the clearing barely lifted their heads to look at me as I passed by. I found a series of excellent campsites in the meadow lands along the sandy beach and set up my tent in a grove of spruce trees just steps away from the beach. It was low tide and miles of rocky flats were exposed revealing tide pools wrapped in sea weed and kelp. A group of sea lions were barking their distinctive ork ork ork sounds from a rock just offshore while the squeaky “rusted gate” squeals of bald eagles drifted down from the trees above me. I had the whole cape to myself, not another person in sight. After setting up my tent I walked along the deserted beach to a low point of land just north of me that formed the westernmost tip of the coterminous United States. From there I could walk across the exposed rock and all around Tskawahyah Island which was now connected to the shore but would be inaccessible in a few hours when high tide came in. I poked around the tide pools as I went and I noticed a few lime green sea anemones clinging to the rocks, some small crabs scuttling around, but no star fish. In recent years an unknown disease has swept up the Pacific coast killing off the star fish and where I’d normally see hundreds there were none. I stumbled across an ancient ship’s chain rusting away in a sandy tide pool, a relic from some long-ago shipwreck. This portion of the Pacific coast is known as the graveyard of the Pacific from the history of shipwrecks along this rocky coast line. It disappeared into the sand connected to who knows what below the surface. As I walked back to the shore line after circling the island I noticed a couple of bald eagles circling overhead. Then another joined them, and then another. Finally a group of six eagles were turning lazy circles above me seeming to be playing more than hunting. Generation to generation our people have shared the wealth from the land and the sea. From this we have gained appreciation of the wisdom of our forefathers. From this site we have gained new strength. In their honor we dedicate this memorial. This rich culture. Our proud heritiage. I took my pictures and left quietly. By now it was late afternoon, time for dinner, so I returned to camp and prepared my freeze-dried lasagna while watching the sun set over the Pacific. Tomorrow I’d hike south along the coast line to Sand Point but tonight I rolled into my sleeping bag listening to the sea lions barking and the surf gently rolling in. The next morning my wake-up call came in the form of a loud kraw-kraw-kraw in front of my tent that broke the silence of the grey pre-dawn light. It was shockingly loud, but I immediately recognized the sound – a great blue heron. I peeked out of my tent and sure enough, there he was standing on a rock in the surf about thirty meters away. I made my coffee and packed my backpack. The tide was coming in and I knew I had to get going since there are a few points along the way that are more difficult to pass at high tide. Besides, a mile south of Cape Alava is another rocky point of land known as Wedding Rocks where a number of Makah petroglyphs are inscribed on the rocks and I wanted time to explore them. I made it to Wedding rocks in less than an hour, but had to crawl through some blown-down spruce trees that blocked the way along the beach. Along the shoreline the park Service has placed markers to show hikers where overland trails are located in order to pass above rocky headlands otherwise impassable at high tide. Unfortunately the marker for Wedding Rocks was hidden inside a tangle of blown-down trees and I didn’t see it. Instead I ended up battling my way through thick brush and steep ravines over the headland. Later I found the trail which passed across the headland far below the steep, brushy route I had taken. When I finally descended back to the beach at the south side of Wedding Rock I had wasted valuable time and the tide was full in. I looked around and found a few petroglyphs – a distinctly unhappy woman, probably namesake of Wedding Rock, and some wide-eyed faces staring out into the ocean with haloes of vines and leaves above them (probably representing salal, the common evergreen vine that forms the undergrowth of the area). I knew there were many more petroglyphs, but I wanted to reach Sand Point so I pushed on around a small cove only to encounter a large rock dropping straight into the ocean with a large driftwood log pinned against its base. It was impassable. The surf was washing onto the log making its surface far too slick to walk on and the water under it was deep and turbulent – way too dangerous. The way above the rock was a thicket of brush up a vertical walled ravine. But, a small stream flowed out of the ravine and into the ocean at this point, so I filled my water battle with “Ozette Tea” and retreated back to Wedding Rock to wait for the tide to recede. As it turned out the delay was well worth it. The afternoon sun warmed the grassy flats at Wedding Rock making it almost hot and as the tide receded I found more petroglyphs lower along the tide line – fanciful killer whales and more wide-eyed people staring out from the rock. 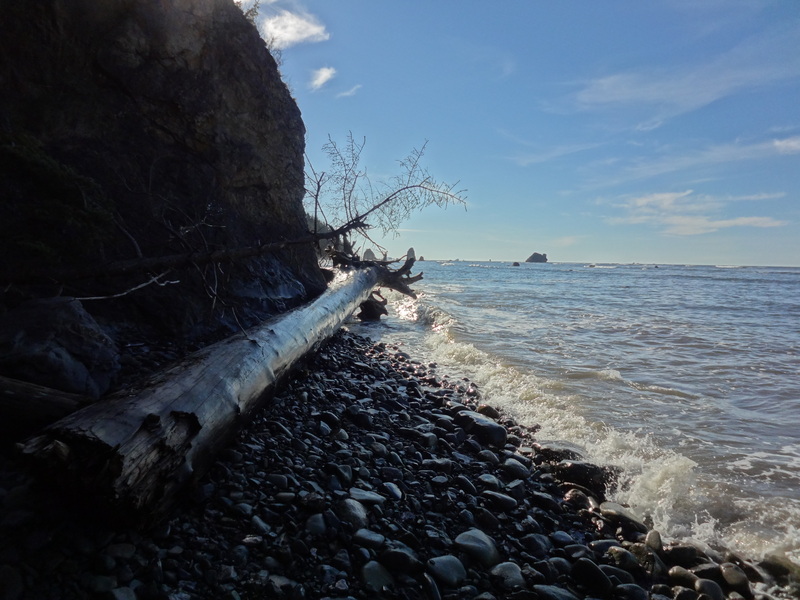 I had my lunch of crackers and cheese, took a nap, climbed on top of Wedding Rock, and after a couple hours saw that the tide had receded enough to pass the deadly log. So I shouldered my pack, walked around the small cove once more and easily walked past the log on a gravelly beach. From there the way along the beach opened up. With the tide going out I had more room to walk around blown-down trees, the beaches became more sandy and easier to walk and by the time I reached Sand Point two miles south of Wedding Rock the hike had turned into an easy stroll along the beach. 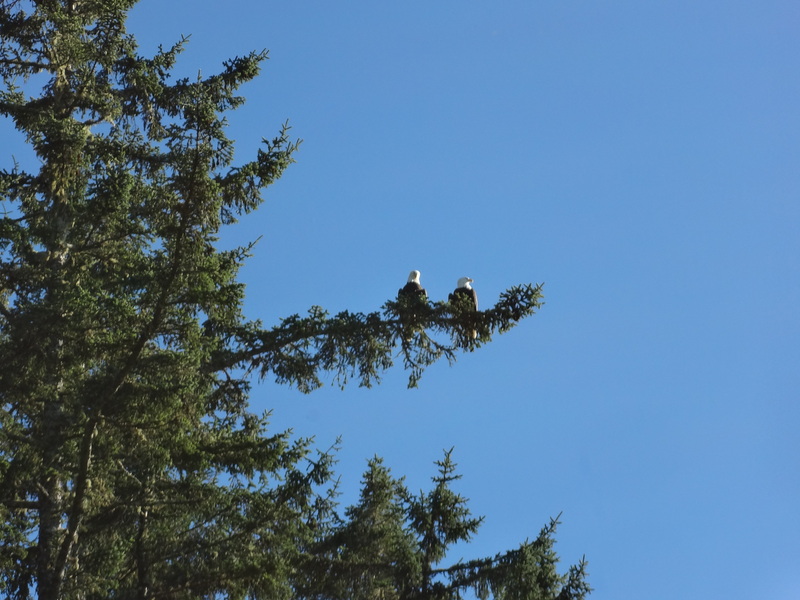 As I walked into Sand Point a pair of bald eagles watched from their perch in a shoreline tree as I passed underneath them. I found another excellent camp in the forest along the shoreline and set up for the evening. Once again I had the entire area to myself, no one else in sight. Sand Point isn’t as dramatic as Cape Alava, but nice in its own right. Broad, sandy beaches stretch away for miles to the south, a large rock shelf full of tide pools is exposed at the point at low tide, and odd shaped sea stacks jut out of the ocean. Low tide came as the sun began to set so I spent the afternoon exploring the tide pools and walking the sandy beaches. Evening approached and I made my dinner as small bats flitted around through camp. 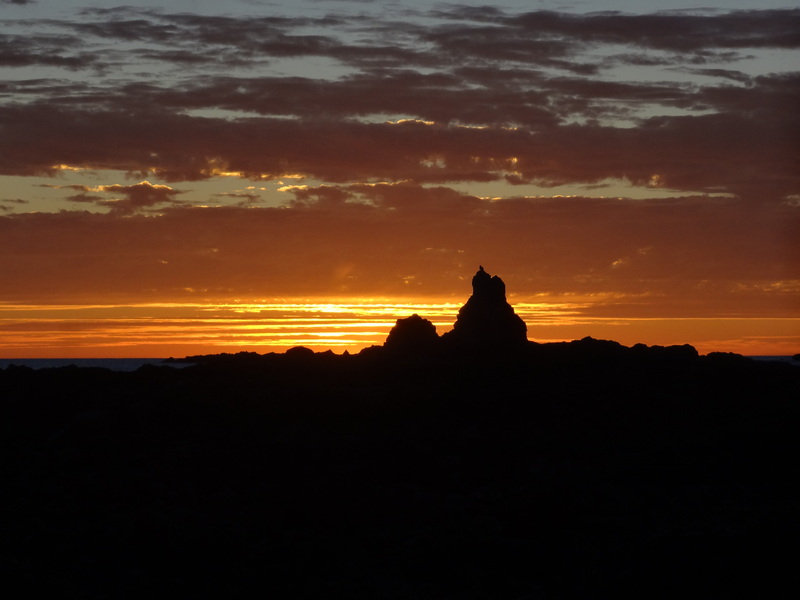 As evening deepened I walked back out onto the rocky shelf to watch a spectacular sunset over the Pacific. By dark I had returned to camp and rolled up into my sleeping bag with the surf softly rolling in over the sandy beaches. The next morning I woke early to pack up and walk out. It would be over a five hours’ drive to get home from Lake Ozette, not including the hour and a half to hike out, and I wanted to get home before dark. As I quietly took down my tent a piercing screech sounded in the tree above my camp. I recognized the sound – a bald eagle, and as I stepped back to see where it was I saw his bright white head looking down at me from his perch directly over my tent. He must have flown in after I’d gone to bed last night and was as shocked as I was to discover that he had a neighbor. We watched each other for half an hour until he flew off to join another eagle flying up the beach and I shouldered my pack for the hike out. TIDES: Tides change between high and low every six to eight hours or so in Washington State and the difference between them can be nine feet or more. Entire bays can empty out and refill, wide beaches can disappear under incoming tides, rocky points can become islands and some places can be impassible at high tide. Besides, hiking along the coast line at low tide is much easier than hiking at high tide since you can walk around obstacles rather than over them, so carrying a tide table is essential. Tide tables can be printed off the National Oceanic and Atmospheric Administration website (NOAA) or purchased at regional sports stores or ranger stations on the Olympic Peninsula. ANIMALS: The most troublesome animal you’re likely to encounter are raccoons which have become accustomed to people along the coast. For this reason the Park Service will require that backpackers carry their food into the coastal wilderness in “bear vaults”, polycarbonate jugs with screw on lids. The Park Service will rent you one for about $3/day, or you can buy your own off of amazon.com or at backpackers’ stores like REI. SHORELINE HIKING: The Pacific coastline within Olympic National Park varies from wide sandy beaches, to gravel and cobble passages around headlands. 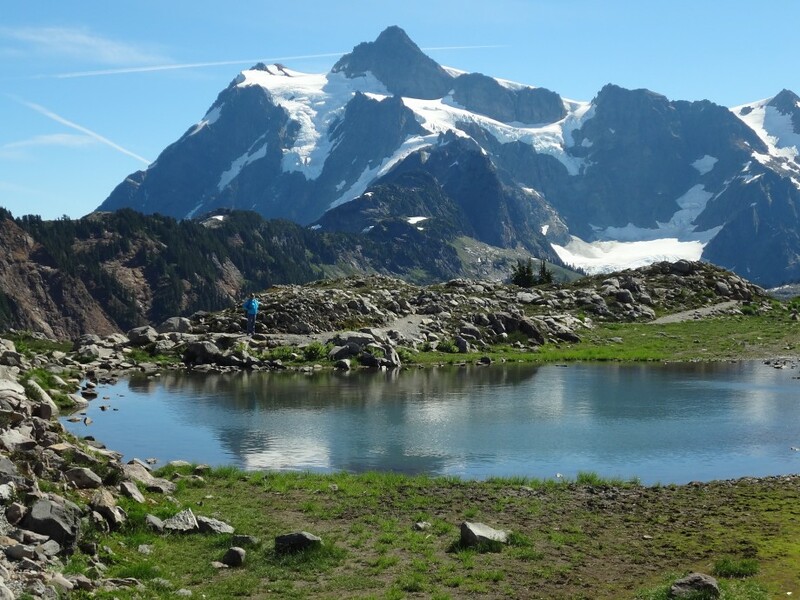 You’ll need to have a wilderness permit from the Park Service for overnight trips which you can pick up at the ranger station in Port Angeles on the north side or at Lake Quinault on the southern side of the park. While there’s no elevation gain along the coast, it still can get exhausting trudging through soft sand or over slippery rocks with a backpack on. Also there are many blown down trees that you may have to crawl over or under and some headlands that are impassible even at low tide. But all the major headlands have overland trails around them which are marked by round, painted shields nailed to trees and equipped with ropes to help climb up short but steep and usually muddy slopes. A pair of inexpensive work gloves comes in handy for protecting your hands when climbing up ropes and trails over headlands. A few areas, like sand Point, don’t allow campfires and you’ll need to carry a backpacker’s stove to heat food and water. Actually, you’ll want the stove everywhere since driftwood burns very poorly and some camp areas have been stripped of available firewood.